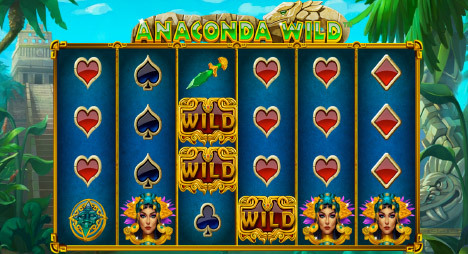 Anaconda Wild is a 6-reel, 50-line slot at Fly Casino. Built with amazing graphics, this great game comes with ancient Mayan temples and special wild symbol. This feature is really fun! We will not detail to much of it here, it’s best for you to try it for yourself. Any Anaconda Wild will reveal a snake which slithers to adjacent and not diagonal positions with a respin occurring on each move he makes. So, if the snake appears you will get at least 4 respins as the Anaconda only disappears when he gets back to the position he started. 100% Bonus! On Sunday from 00:00GMT until 23:59 GMT, all members on their deposit of just $/£/€30 or more will receive a 100% bonus up to 100.00. Double $77’s Monday! From 00:00GMT until 23:59 GMT, all members on their deposit of $/£/€30 or more get a 77% bonus up to $75.00. Claim 2X. 166% Big Money Tuesday! From 00:00GMT until 23:59 GMT, all members on their deposit of $/£/€30 or more will receive a 166% bonus up to $166.00 bonus.